I am such a fan of curry that I was pretty sure I couldn't go wrong with Turkey Curry on Flatbread from Every Day with Rachael Ray. I was in no mood to make a complicated recipe (some people think none of her recipes are complicated, but I do! ), so I did the "look for a short list of ingredients" recipe selection method. This recipe also had the "only three steps to make it" benefit. I didn't change much in this recipe, but you could really mix it up to have it include veggies or spices that you prefer. Next time, I might add some peppers to jazz it up a little bit. I think this is another example of Rachael teaching a method instead of just a recipe. 1. In a medium skillet, heat 2 tablespoons olive oil over medium heat. Add the onion and curry powder and cook, stirring, until the onion is softened, about 5 minutes. Add the turkey and cook, breaking up the meat with a spoon, until browned, about 5 minutes. Stir in the cheese until blended. Remove from the heat and stir in the yogurt, lemon peel and lemon juice; set aside. 3. 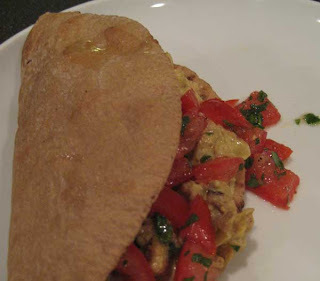 Place a warm pita on each plate, top with the turkey curry and tomato salad and fold over. Huge fan of this recipe over here at the B Family household. Even the 2 year old loves it.